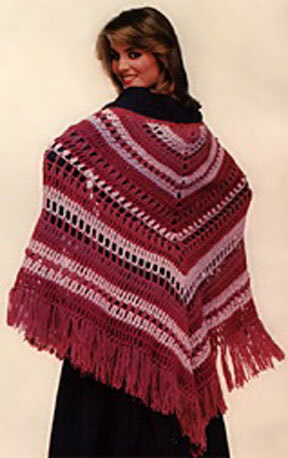 For those cool summer evenings, take along this lacy, fringed shawl to keep you warm. Work the triangle-shaped shawl in graduated colors as shown, one color, or any combination of yarn colors that strike your fancy. Measuring across, 5 triple crochets (tr) = 2"
Top to bottom, 1 tr row = 1"
Beginning at the center top edge of the shawl with Color C, chain (ch) 5. 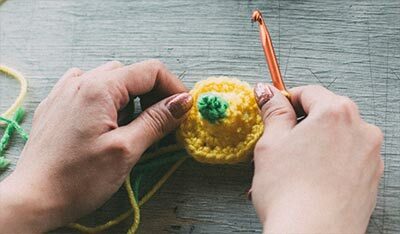 Join with a slip stitch in the first ch made to form a ring. This row is on the right side of the work. Ch 4, work 4 tr in the ring, chain 3, work 5 tr in the ring. Counting the turning ch-4 as 1 stitch, you will have 5 tr on each side of the center ch-3 space. Ch 4 and turn the work around. Work 2 tr in the first tr and 1 tr in each stitch until you reach the ch-3 space. Work 2 tr in the ch-3 space, ch 3, work 2 tr in the ch-3 space. Work 1 tr in each stitch until you reach the turning chain, work 3 tr in the top of the turning ch. Change to Color A. With Color A, repeat Step 3. Ch 4 and turn the work around. Work 2 tr in the first tr, ch 1, skip the next tr and work 1 tr in the next tr. Continue to work ch 1, skip the next triple crochet and work 1 tr in the next tr until you reach the ch-3 space. Ch 1, work 1 tr in the ch-3 space, ch 3, work 1 tr in the ch-3 space, ch 1. Work 1 tr in the next tr, ch 1, skip 1 tr. Continue to work 1 tr in the next tr, ch 1 and skip the next tr until you reach the turning ch-4; work 3 tr in the top of the turning ch. Change to Color C.
With Color C, ch 4 and turn work around. Work 2 tr in the first tr, ch 1, skip the next tr, work 1 tr in the next tr, then ch 1 and skip the next ch-1 space, work 1 tr in the next tr. Continue to ch 1, skip the next ch-1 space and work 1 tr in the next tr until you reach the ch-3 space. Ch 1, work 1 tr in the ch-3 space, ch 3, work 1 tr in the ch-3 space, ch 1. Work 1 tr in the next tr, ch 1 and skip the next ch-1 space. Continue to work 1 tr in the next tr, ch 1 and skip the next ch-1 space until you have 2 tr and the turning ch-4 left unworked; work 1 tr in the next tr, ch 1 and skip the next tr, work 3 tr in the top of the turning ch. Ch 4 and turn the work around. Work 2 tr in the first tr and 1 tr in each of the next 2 tr, then work 1 tr in the next ch-1 space and 1 tr in the next tr. Continue to work 1 tr in the next ch-1 space and 1 tr in the next tr until you reach the ch-3 space. Work 2 tr in the ch-3 space, ch 3, work 2 tr in the ch-3 space. Work 1 tr in the next tr and 1 tr in the next ch-1 space. Continue to work 1 tr in the next tr and 1 tr in the next ch-1 space until you have 2 tr and the turning ch-4 left unworked; work 3 tr in the top of the turning ch. Change to Color B. With Color B, repeat Step 3; change to Color A. With Color A, repeat Step 3; change to Color C.
With Color C, ch 4 and turn the work around. Work 2 tr in the first stitch, ch 1 and skip the next stitch. Make a puff stitch in the next stitch as follows: wrap the yarn over the hook and draw up a 1"-long loop in the next stitch, wrap the yarn over the hook and draw up a 1"-long loop in the same stitch, wrap the yarn over the hook and draw up a 1"-long loop in the same stitch, wrap the yarn over the hook and draw it through 6 loops on the hook, wrap the yarn over the hook and draw it through both loops on the hook. 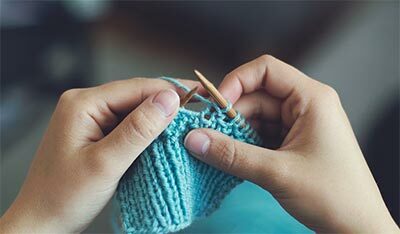 Continue to ch 1, skip the next stitch and work a puff stitch in the next stitch as before until you reach the ch-3 space. Ch 1, work puff stitch in the ch-3 space, ch 3, work a puff stitch in the ch-3 space, ch 1. Work a puff stitch in the next stitch, ch 1 and skip the next stitch. Continue to work a puff stitch next stitch, ch 1 and skip the next stitch until you reach the turning ch-4; work 3 tr in the top of the turning ch. change to Color A. With Color A, ch 4 and turn the work around. Work 2 tr in the first tr, and 1 tr in each of the next 2 tr, work 1 tr in the next ch-1 space and 1 tr in the next puff stitch. Continue to work 1 tr in the next ch-1 space and 1 tr in the next puff stitch until you reach the ch-3 space. Work 2 tr in the ch-3 space, ch 3, work 2 tr in the ch-3 space. Work 1 tr in the next puff stitch, and 1 tr in the next ch-1 space. Continue to work 1 tr in the next puff stitch and 1 tr in the next ch-1 space until you reach the turning ch-4; work 3 tr in the top of the turning ch. Change to Color B. With Color B, repeat Step 3 twice; change to Color C.
With Color C, ch 4 and turn the work around. Work 2 tr in the first stitch, skip the next stitch, work 1 tr in the next stitch, then work 1 tr in the skipped stitch. Continue to skip 1 stitch, work 1 tr in the next stitch, then work 1 tr in the skipped stitch until you reach the ch-3 space. Work 2 tr in the ch-3 space, ch 3, work 2 tr in the ch-3 space. Skip the next stitch, work 1 tr in the next stitch, then work 1 tr in the skipped stitch. Continue to skip 1 stitch, work 1 tr in the next stitch, the work 1 tr in the skipped stitch until you reach the turning ch-4, work 3 tr in the top of the turning chain. Change to Color B. With Color A, repeat Step 10; change to Color C.
With Color C, repeat Step 11. With Color C, repeat Step 13; change to Color B.
Repeat Steps 4-12; do not change colors. Ch 1 and turn the work around. Work 3 single crochets (sc) in the end of each row along the top edge until you reach the center ring, work 1 sc in the center ring, work 3 sc in the end of each row to the end of the top edge. Cut 3, 16" strands of Color C.
Holding the strands together, fold them in half. From the right side, insert the crochet hook through 1 stitch on a side edge. Pull the fold through the stitch. Pull the ends of the strands through the loop. Repeat Steps 1-5 in each stitch along the side edges.